Call, text, or email me and I will contact you back. (631) 974-2498 or timeriegatto@gmail.com. We'll discuss your wedding and I'll suggest pieces to complement it. I am open-minded, and easy to work with. I will coordinate with you, your officiant, and/or your wedding coordinator to assure a seamless performance. Together we'll create the perfect combination to delight your guests! Can you perform outdoors? Will you be heard? Yes, I can play indoors or outdoors, if weather permits. My acoustic violin can be very loud if I wish. If I am playing outdoors, I may play my electric violin with my small amplifier so I can be heard for wedding ceremonies. I will need access to an electric outlet. I will arrive 20 minutes or more before your event. I'll seek you out and/or the coordinator or officiant to check on timing, cues, and set-up location. I will unpack, hide my coat and case, set up my violin and warm-up to be sure everything sounds good. Can I hear you play before I hire you? Sure. 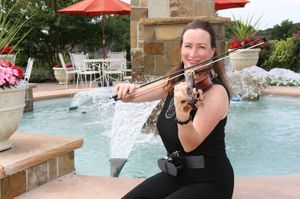 Click on my Wedding Music Guide or Strolling Violin Music to hear me play! My fee is competitive with other violinists on Long Island. Please contact me for details. You can send payment by check, cash, or through the Venmo app. 1. Call, text, or email me to make sure I have your date and time available. I will respond with an answer as soon as I can. 2. Visit this website to listen to me play and choose songs you'd like. 3. Email your song list to me. Your event WILL BE CONFIRMED when the $25 deposit is received. 5. Contact me with any changes or other songs you'd like me to learn. 6. If you wish to mail your total payment before your event occurs it will make the event run more smoothly since I will not have to interrupt you. I use Venmo to make it easy. 8. Tips are not necessary but are surely appreciated! Can you recommend a great DJ?